The Battle of Iwo Jima holds a place of honor in the Marine Corps' proud history. This guide is intended for Marines to kickstart their own in-depth study to better understand the context and implications of this key battle. 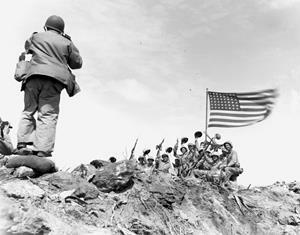 Holland, the raising of that flag on Suribachi means a Marine Corps for the next five hundred years. 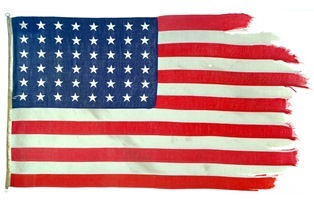 The flag raising on Mount Suribachi came four days after the initial landings on the island of Iwo Jima though the battle itself would not conclude for another four weeks. During the battle, more than 70,000 US Marines, Sailors and Soldiers would fight to seize the island from the approximately 22,000 defenders led by LtGen Kuribayashi. The battle itself would become a hallmark of Marine Corps history, iconized by the US Marine Corps War Memorial located in Arlington, Virginia. February 2015 marks the 70th Anniversary of this key battle so it is fitting to reflect on the details of this important event. Like the other epic battles of the island hopping campaign across the Pacific in World War II, Iwo Jima serves as a reminder to those of us wearing the uniform today, of what our fellow Marines accomplished to secure our place in American History and to ensure that “our country believes that we can” as stated by LtGen Krulak to the Commandant, General Pate, in 1957. It is also important to note that of the approximately one million remaining veterans of World War II, more than 500 pass away each day. This sobering fact should encourage us to take the time to seek out those who took part in this battle and learn from their memories, lest we forget the sacrifices and challenges they overcame to ensure we have a “Marine Corps for the next five hundred years”. The video above is an interview with one of our own, Mr. Frank Matthews, who fought ashore with the 24th Marine Regiment. He is currently serving as a docent at our National Museum of the Marine Corps and the interview affords those without the ability to visit the Museum an opportunity to hear his recollections. Additionally, we've compiled numerous written documents preserved by the USMC History Division located in Quantico, Virginia. You can find those resources to help give your self-studies context and depth under the "Documents" and "Recommended Reading" tabs. You can also find pictures of just a few of the invaluable artifacts maintained by the National Museum of the Marine Corps along with numerous pictures and maps maintained by the History Division and the USMC Archives located under the "Images" and "Maps" tabs. Finally, we've provided links to a selection of videos which will enhance your ability to get a visceral sense of the battle. The Battle of Iwo Jima holds a place of honor in our proud history. We sincerely hope that using these resources as a starting point, you will spend time over the next few months continuing your own in-depth study to better understand the context and implications of the battle.